Sure, Scout can be a little panicky. But in this case, he’s got good reason. And he’s actually pretty good under pressure, coming up with a plan to get Bigfoot somewhere safe and allow the big guy to keep his cherished souvenirs — as long as they can pack that bag in record time. I know, Scout. I’m working as fast as I can, trying to stay ahead of the weekly deadline. But it’s tough. The cast of this book is bigger than the first one. Who knew that’d take longer? Everyone but me, I guess. The good news is we’re coming close to the end of the first arc of the story — season one, as some folks put it — at which point I’ll take a little break, regroup, and work on building up a little buffer for season two. But I’ll be adding even more characters in the next arc so it feels like I really haven’t learned anything at all about time management. Looks like they might have a chance to evade these opportunistic clods! Maybe Scout should stay behind to growl at them and play on their suspicions. Okay, WAIT—forget I said that. Oh things are getting tense! Pack that bag quickly guys! I will miss seeing these guys during your break, but you definitely deserve it after all these pages. Thanks for putting this great story out there for us week after week! Are you trying to get on my good side with these generous, understanding comments? Because it’ll probably work. Yep, there’s a very special friendship going on here! 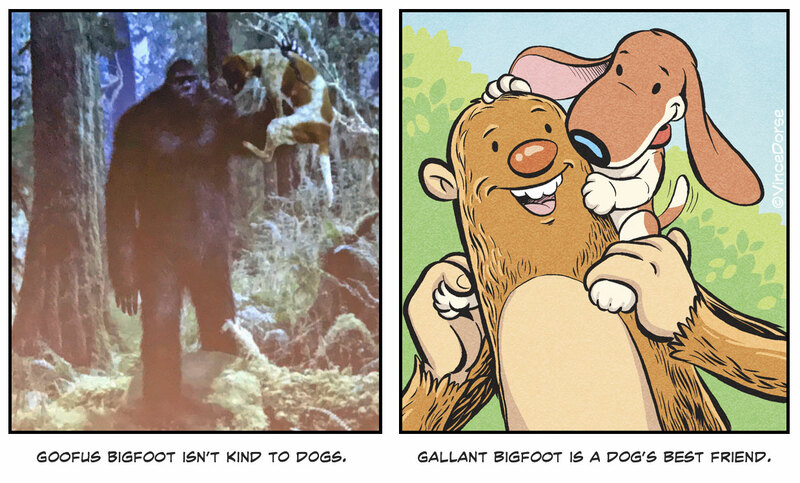 But then, this isn’t an ordinary sasquatch story either. It’s an extraordinary sasquatch story!